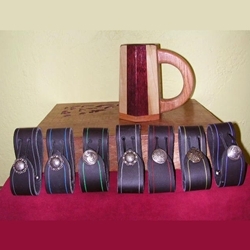 What better accessory is there at the Faire than a mug strap? Ours is of heavy leather and will fit up to a 3" belt. Concho securely holds your keepsake for easy access at the pub. Available in either black or brown leather and your choice of colored or plain etching to compliment your costume. Hand made in the U.S.